Sugar cookie recipes haunt me in the same sort of fashion that chocolate chip cookie recipes used to. If I saw a new recipe for chocolate chip cookies, I had to try it. No ifs, ands or buts. What if I didn’t and I missed out on quite possibly the best chocolate chip cookies ever? That was not a risk I was willing to take. Luckily almost two years ago I did find the best chocolate chip cookie recipe ever. Surely you’ve heard me talk about the Thick and Chewy Chocolate Chip Cookies that have transformed my life? Well, sugar cookie recipes invoke the same anxiety for me. I can’t let one slip by lest I squander an opportunity to find The One. So when I was flipping through my Baking Illustrated I almost fell off my chair when I realized that I had yet to try the soft and chewy (those words are like magic for me) sugar cookies in the book. Off to the kitchen I went! These cookies are flat-out fantastic. 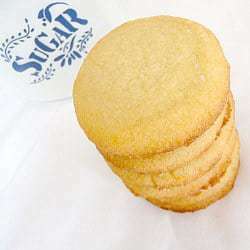 It is not often that I eat a plain sugar cookie without any type of icing, and these were delicious in every way a sugar cookie should be. 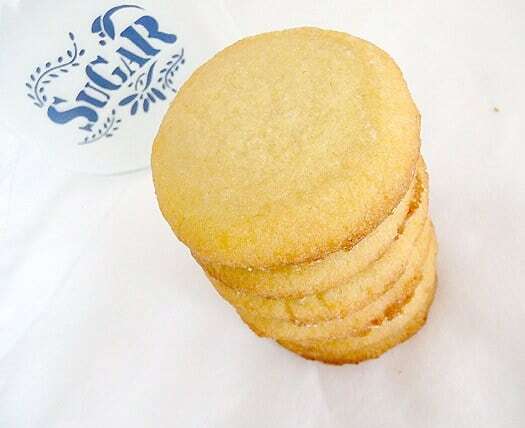 Soft, chewy, buttery and sweet, these are the essence of what every sugar cookie aspires to become. Rolling them in sugar prior to baking allows them to create a nice sugary crust in the oven, that gives way to buttery softness when you bite into them. And I know the next thing you want to know is – can I use this recipe for cut-out cookies? Why yes, yes you can! I was not about to bake sugar cookies and not test out their cut-out-cookie worthiness. And so, with half of the dough I did a cut-out test. The cookies held their shape very nicely and even after cooling and a couple of days in a storage container, they still had the soft chewiness that I love about sugar cookies. Prepare the dough as directed through Step #2 in the directions below. Remove dough from refrigerator and let sit at room temperature for 10-15 minutes. Flour the counter, the dough and a rolling pin and roll the dough out to ¼-inch thickness. 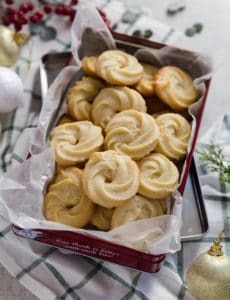 Dip a cookie cutter in flour and cut out your cookies, placing them on a parchment-lined baking sheet. Refrigerate the baking sheet for at least 15 minutes before baking. Preheat the oven to 375 degrees F.
Bake for 8-9 minutes until edges are just ready to turn the slightest bit light brown (you really don’t want much coloring at all on these cookies), rotating the pan 180 degrees halfway through baking. 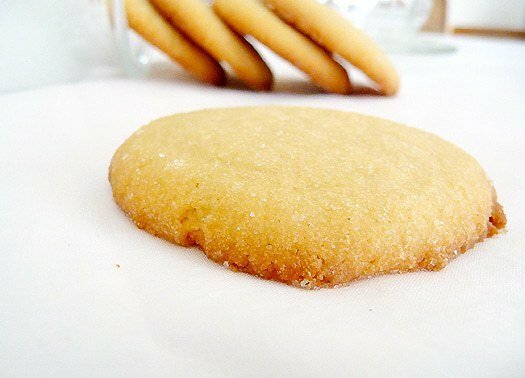 In comparison to what has become my standard sugar cookie recipe for the last year or so, I would say that these definitely held their shape better and didn’t spread as much, and stayed softer longer, which I attribute to the addition of a small amount of brown sugar in the dough. So, if you want plain sugar cookies, these are amazing. And if you want to make cut-out cookies? Also amazing. You can’t go wrong, period. 1. Adjust the oven racks to the upper- and lower-middle positions and heat the oven to 375 degrees F. Line 2 large baking sheets with parchment paper or spray them with nonstick cooking spray. Whisk the flour, baking powder, and salt together in a medium bowl; set aside. 2. Cream the butter, the 1 cup granulated sugar, and the brown sugar at medium speed until light and fluffy, about 3 minutes, scraping down the sides of the bowl with a rubber spatula as needed. Add the egg and vanilla; beat at medium speed until combined, about 30 seconds. Add the dry ingredients and beat at low speed until just combined, about 30 seconds, scraping down the bowl as needed. 3. Place the ½ cup sugar for rolling in a shallow bowl. Fill a medium bowl halfway with cold tap water. Dip your hands in the water and shake off any excess (this will prevent the dough from sticking to your hands and ensure that the sugar sticks to the dough). Roll a heaping tablespoon of dough into a 1½-inch ball between moistened palms, roll the ball in the sugar, and then place it on the prepared baking sheet. Repeat with the remaining dough, moistening your hands as necessary and spacing the balls about 2 inches apart (you should be able to fit 12 cookies on each sheet). 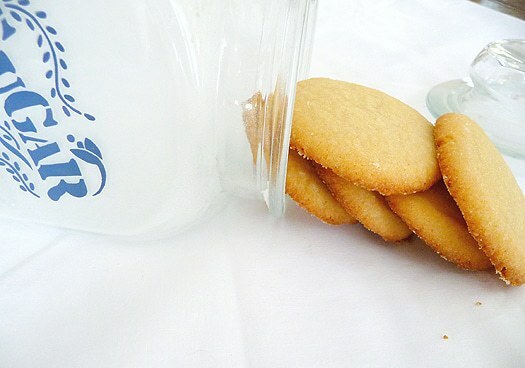 Butter the bottom of a drinking glass and then dip the bottom of the glass in the remaining sugar. 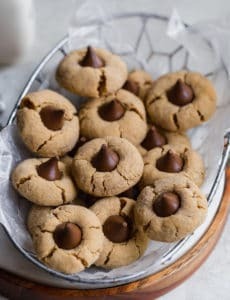 Flatten the dough balls with the bottom of the glass until they are about ¾ inch thick, dipping the glass in sugar as necessary to prevent sticking (after every 2 or 3 cookies). 4. 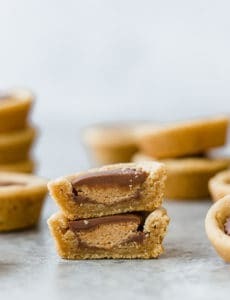 Bake until the cookies are golden brown around the edges and their center are just set and very lightly colored, 15 to 18 minutes, rotating the baking sheets front to back and top to bottom halfway through the baking time. Cool the cookies on the baking sheets about 3 minutes; using a wide metal spatula, transfer the cookies to a wire rack and cool to room temperature. Store in an airtight container at room temperature. I know this post was like…long way back, but I just wanted to let you know how much I appreciate the recipes and how easy you make it to follow! I love the tips and little baker secrets that you have learned and then graciously share. You are my go to for recipes, so I knew I could count on this cookie! I made it as the base of my fruit pizza and it was perfect! !